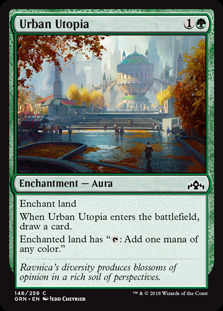 The new year in the Magic calendar has started, and we’re spending the year on Ravnica. 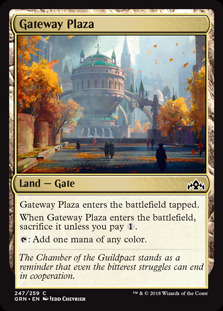 While the Spring set will be something different, the first two sets are the traditional five-guild structure we’ve seen, though the specific guilds are different than Return to Ravnica/Gatecrash. Of course, each guild has its own mechanic, so let’s get to them. After two failed Dimir mechanics for different reasons, WotC has resorted to a simple “Scry with upside” it’s used multiple times before. The mechanic may be boring, but the surprise is just how much of it there is. 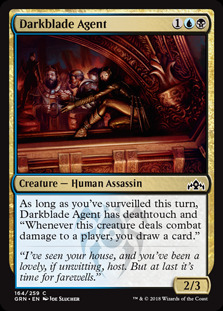 Twenty-one cards allow you to Surveil, including nine commons. 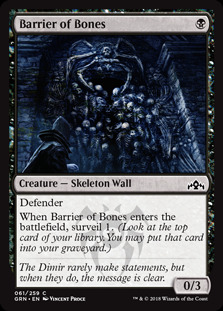 More importantly, other than some outliers like Dazzling Lights and Barrier of Bones , most of them are reasonably playable even before Surveil. 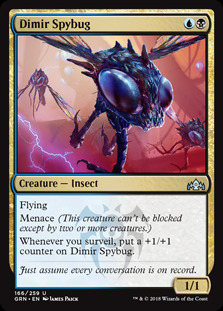 It’s also surprising how much explicit Surveil support there is at low rarities like Darkblade Agent and Dimir Spybug , even before you consider synergies with Jump-start, Undergrowth, and the self-mill cards like Narcomoeba . 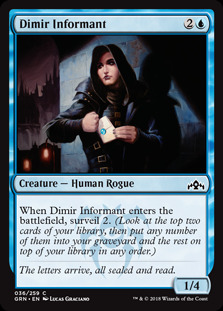 Surveil is always going to be welcome like most smoothing mechanics, but there is also going to be a Surveil deck that seems very competitive. 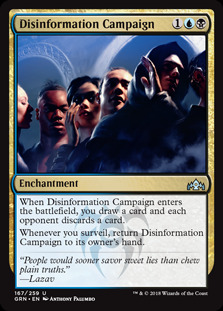 If I may digress into design feedback for a second, I feel like Surveil is going to be viewed as a design mistake just like Transmute and Cipher. 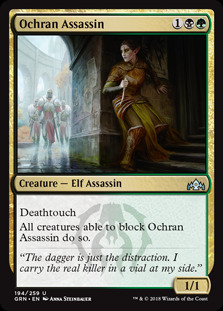 Obviously the mechanic itself is fine, but there’s no reason the word needs to be on over 35% of the Dimir-colored cards. 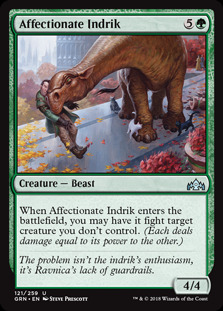 Yes, that’s inflated a bit by the direct references on cards like Darkblade Agent (as opposed to generic self-mill cards for Undergrowth or cards that like being tapped for Convoke, for example), but those mechanics don’t lead to repetitive game states. Dimir/UB is built towards repetitive game states by its nature, but I’m wondering if Play Design is naturally going to tend towards the game being more consistent. Of course, this is just a single data point, but it’s something to watch. Back to the Limited review! 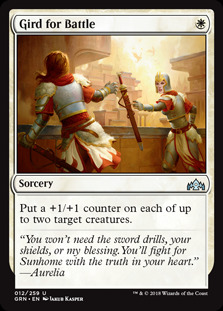 The other way to avoid a mistake is to reuse a mechanic, and Guilds of Ravnica does that with Selesnya. 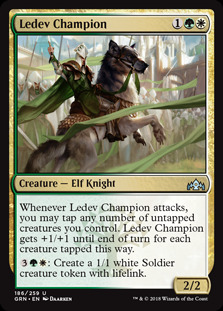 Surprisingly there aren’t that many token producers outside of Sworn Companions , Ledev Champion , and some rares, so you’re mostly playing fair with Convoke and using actual creatures. 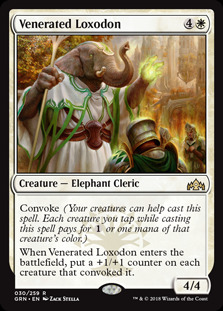 I wish the mechanic was evolved a bit more outside of Venerated Loxodon on its fourth appearance, but the mechanic is still good. 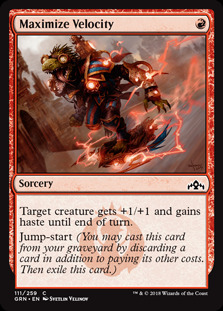 If Flashback and Retrace had a baby you’d get Jump-start, a mechanic that’s clearly worse than both yet is still good in a semi-graveyard set. 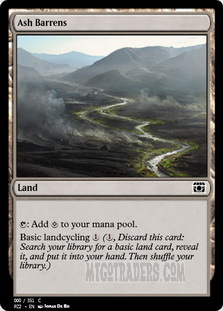 You’re probably only going to play the removal spells and draw spells, but turning an extra land into an Inspiration or three-mana Shock is a good deal. 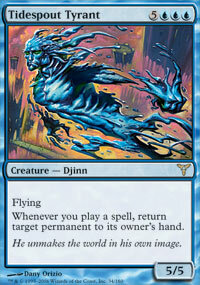 Of course, there are also the spell aspects in the set, but we’ll get to that when we cover Izzet. 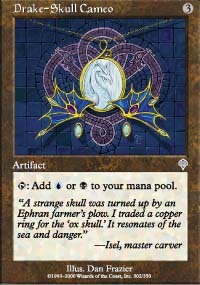 How many creatures will be in your graveyard at any given time? Your deck will be ~40% creatures (more if you’re building towards Undergrowth) and they’re going to die eventually even if you don’t discard or mill them. 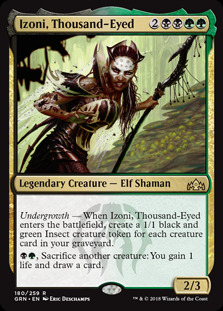 The nicest part is that outside of the archetype cards like Golgari Raiders and Rhizome Lurcher (two cards that are way too similar to be in the same set), most of the Undergrowth effects are fine at 0, good at 1, and then scale. 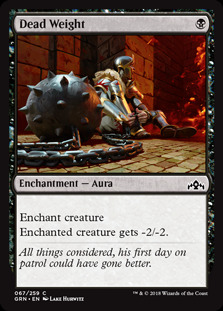 My concern is that most of the “fine” cards seem underpowered, while the archetype cards seem too hard to set up. 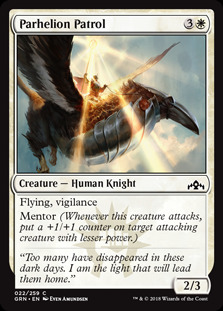 The Boros mechanic is a simple one, but it’s very easy to underestimate. 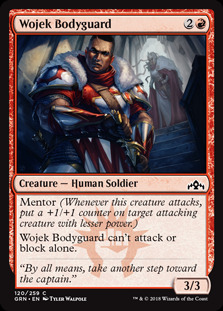 While lots of the cards like Parhelion Patrol and Wojek Bodyguard are efficient and get Mentor essentially for free, I’m not sure about all the imbalanced cards like Barging Sergeant and Hammer Dropper . Yes, high power means you’re more likely to get the Mentor trigger, but you probably won’t get more than one attack out of it. I’d rather use cards that are efficient on their own then pump them with spells you’re already playing, but we’ll see if there’s support for getting creatures through. Both split cards and hybrid mana are designed to make deck building more flexible (the former with card effects, the latter with mana constraints), but here the two are combined. 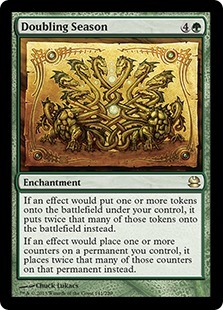 Both the uncommon and rare split card cycles consist of a hybrid card and a gold card of a given guild, and the former is where the baseline starts. 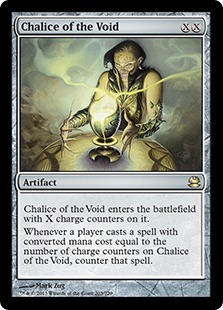 However, with the exception of Invert/Invent , all of the split cards are extremely good. Yes, you probably need access to the gold half to actively play the uncommons in a relatively high-power set, but it can be just a splash, and none are embarrassing. Other than the split cards, hybrid also shows up on an unexciting cycle of commons, as well as the mana rocks for the set, the Lockets. While being able to cash in mana rocks for two cards is great, the HHHH mana cost to do so is contrary to their main purpose of splashing, especially if it’s a double splash (say, playing Selesnya Locket in a base Dimir deck). While the guilds are an obvious first choice for archetypes, you can also play shards/clans that have two guilds overlap. 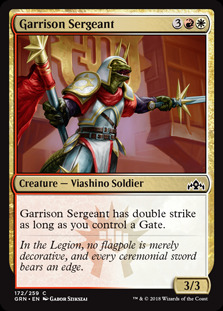 Of course, with a guildgate in each pack you can also try to play all the colors, and thus I’ll cover that last. 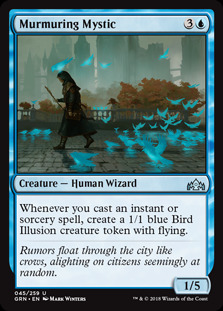 Dimir feels like it is the one guild with two distinct strategies. 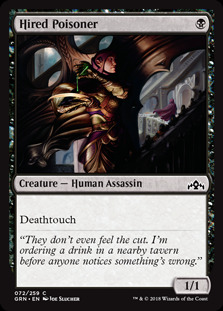 The basic strategy is to use the high card quality to make a good control deck: defensive creatures like Dimir Informant , Hired Poisoner , and Passwall Adept (continuing the trend of strong two-mana 1/3’s), good removal like Capture Sphere and Deadly Visit , and endgame threats like Citywatch Sphinx , Lotleth Giant , and Douser of Lights (why does black get Thornhide Wolves now?). When you combine that with all the Surveil and Jump-start value, the control deck looks like a good place to start in the format. 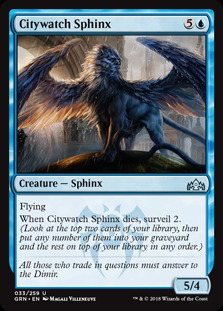 Of course, you can also do the full Surveil theme deck, and there are plenty of enablers. 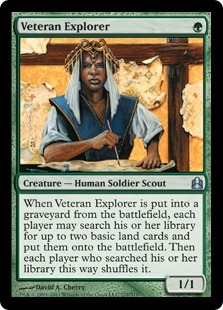 I do want to focus on cards that are at least cards without Surveil like Darkblade Agent and Dimir Spybug rather than Enhanced Surveillance (which seems like a really bad build-around) and Disinformation Campaign (discard seems bad in this format between Undergrowth liking creatures in the graveyard and Jump-start both getting value from the graveyard and encouraging players to keep lands in hand). I also don’t know how much Surveil you can get when most of the cards seem good enough to play, even mediocre ones like Mephitic Vapors and Nightveil Sprite . It also isn’t like you need more than one or two triggers per card to make them great, so this looks like another good baseline. However, having multiple good decks means the guild could easily be overdrafted, so be prepared to move into one of the three-color decks if necessary. 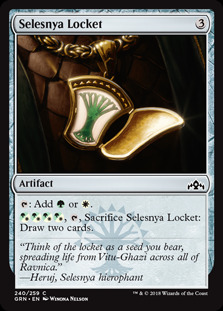 Without as many token makers as previous Ravnica sets you may think Selesnya is doomed, but at first glance that isn’t the case. 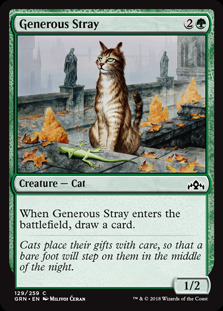 Instead of token makers to get free creatures, Selesnya has creatures that generate value when they enter the battlefield, such as District Guide , Generous Stray , and Sumala Woodshaper . 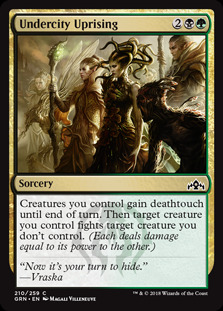 You also don’t need that many creatures in order to get an advantage with Convoke, as it only takes two or three creatures to put out a Siege Wurm ahead of curve or surprise an opponent with a Pack's Favor (though there notably aren’t many instants with Convoke in Guilds of Ravnica). 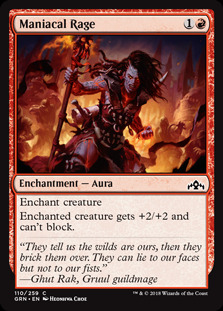 Overall there isn’t much special in Selesnya, but the creatures are good as you would expect, and there’s also good removal with Luminous Bonds and Prey Upon at common along with Conclave Tribunal and Affectionate Indrik and uncommon), so the guild seems fine. Did you know Izzet likes instants and sorceries? 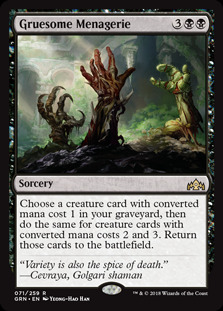 If not, Guilds of Ravnica is going to beat you over the head with it, as the density of “whenever you cast an instant or sorcery” or “the number of instants and sorceries in your graveyard and in exile” cards is much higher than other sets that care about instants and sorceries. However, the biggest problem is that in Limited you normally can’t play a deck with 10+ instants/sorceries since you won’t get that many good ones (card draw and removal), so the cards that don’t do anything unless you have instants and sorceries (Electrostatic Field , Murmuring Mystic ) feel counter to the rest of the strategy. 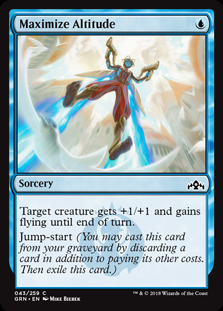 Is this supposed to be a deck that plays a bunch of defenders and goes off in one big turn (using Maximize Altitude /Maximize Velocity as multiple spell casts), or something that chips away gradually? I’d stay away unless you have the money to burn figuring this archetype out. The biggest question about Golgari is how hard you can go on Undergrowth. 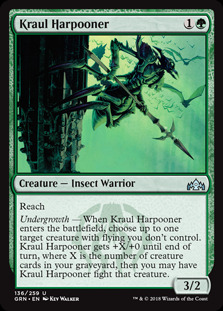 The baseline of good creatures plus removal works, but notably a lot of the removal is creature-based, with Deathtouch (Hired Poisoner , Ochran Assassin ), fight (Prey Upon , Kraul Harpooner ) or both (Undercity Uprising , the fabled “Deathtouch+fight” card that technically can be mono-green yet can’t be due to providing green with direct removal). How good is a deck with 20 creatures, especially in a high-powered format? 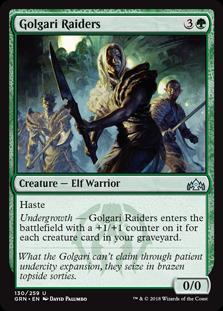 It also feels like Golgari has a lot of good cards and a lot of bad cards without much in-between, which is an interesting dynamic in a format with easy splashing. Overall a simple deck seems fine, but the jury is out on a heavy Undergrowth deck. 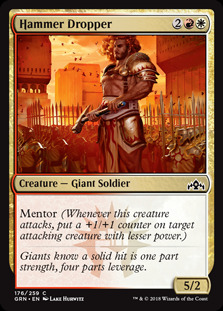 Can the imbalanced Mentor creatures get through? That feels like the balancing factor that will determine how Boros ends up, and at first glance it seems it might work, mostly thanks to fliers. Healer’s Hawk is by far the most pushed Suntail Hawk yet at common, and even a single Mentor trigger turns it from nuisance to threat. 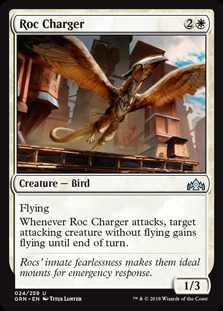 Roc Charger is also an obvious pairing with Hammer Dropper and the like, while tried and true Skyknight Legionnaire is also nice to Mentor. The pump spells are also good, with Gird for Battle surprisingly pushed. Maniacal Rage might also be at its strongest yet here, serving as either a way to manipulate Mentor or get rid of a key blocker for an alpha strike. Boros might not be as fast as in Gatecrash, but it still seems like it’s at the top of the pack. 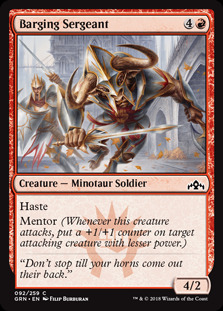 Both Convoke and Mentor care about having creatures on the battlefield, and since Mentor cares a lot about finding a window to attack maybe Convoking won’t be as big of a tempo hit as in the typical Naya deck. The third color doesn’t add much to the other guild’s plan in either case though, and as an aggro deck it hurts moving to a third color, so I wouldn’t prioritize this pairing. On the other hand, adding black to Izzet does a lot, both in terms of removal (even if Dead Weight isn’t at its best here) and card draw (Notion Rain seems perfect for this deck). Red also gives Dimir even more removal and benefits for Surveil, and the control nature of Grixis makes it not hurt as much to support three colors. 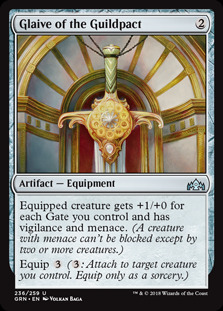 Sultai is in the strange situation where neither color specifically adds anything to the other guild, but both guilds together have clear positive interactions, as Surveil works very well with Undergrowth. Again, I’m not sure how good the payoffs are, especially below rare. 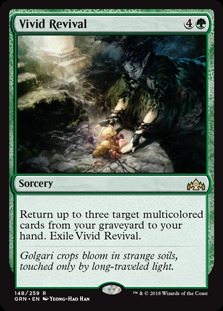 Then again, one of the main reasons to play three colors is to play all those rare bombs, so maybe this is the way to fully maximize your Gruesome Menagerie , Vivid Revival , or Izoni, Thousand-Eyed , and going all-in isn’t worth it otherwise? Or maybe BDM will find a way to go infinite and make Spider Spawning 2. 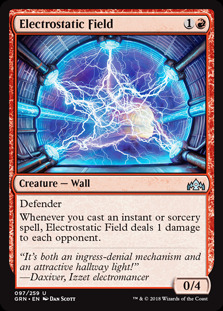 Izzet and Boros have exactly no synergies in their mechanics, and Izzet gains nothing from white, so you would think this wedge is garbage. 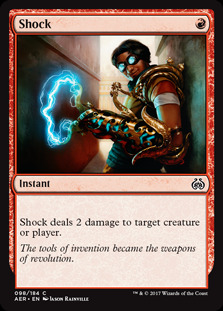 I’m trending that way on initial impressions, but Boros actually doesn’t mind getting bounce spells and other ways to remove blockers from blue. Again, making the aggro deck three colors doesn’t seem like the best idea so I wouldn’t start here, but if Boros is as strong as expected I might like this better as an aggro deck than Naya if you need to branch out to a third color to find enough playables. Other than both wanting creatures, there aren’t any obvious synergies between Selesnya and Golgari. 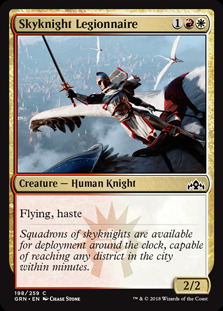 Maybe this is where the slower Convoke cards like Flight of Equenauts go? 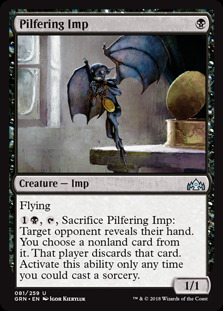 On the other side, black doesn’t have awful cheap creatures like Barrier of Bones and Pilfering Imp , so that helps the Convoke plan. Maybe this deck is good enough based on raw quality, but high-synergy sets generally require synergy, so that might not be enough. 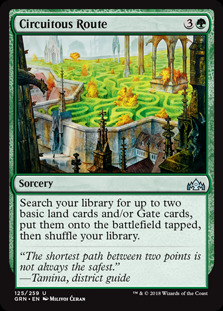 As I mentioned, each pack has one of the aligned Guildgates in it, and combined with green’s powerful fixers District Guide and Urban Utopia and the five-color Gate Gateway Plaza all at common (and Circuitous Route at uncommon), there is plenty of fixing available if you start with a green base. 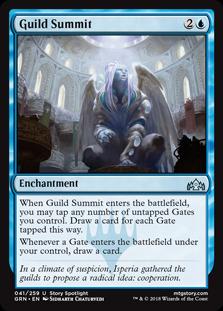 Unfortunately there isn’t that much Gate-matters in the set outside of the fixers as the main benefits are the build-around Guild Summit , the fine Gatekeeper Gargoyle everyone would play, and “card most likely to be underrated” Glaive of the Guildpact (as Garrison Sergeant is mostly a normal Boros card). 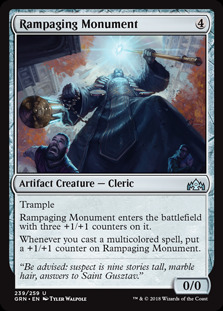 Rampaging Monument is also at its best here (though everyone will probably play it). The biggest problem is that the lockets are just Drake-Skull Cameo and the like for the non-green ones unless your mana is exceptionally good, and that isn’t playable. Maybe I’m underestimating how easy it is to crack Lockets, but I don’t want to be a bunch of colors unless my draft falls apart and/or I get Guild Summit . Rotation means it’s time to clean house on the curated list, and there is plenty to cover. 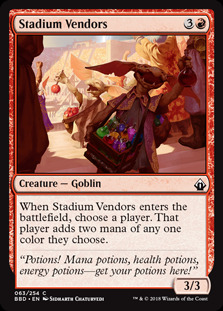 As promised, the rest of the non-multiplayer-focused Battlebond cards are now on the Battlebond list, including Spellseeker , Stadium Vendors , all the Partner-with cards, and more. 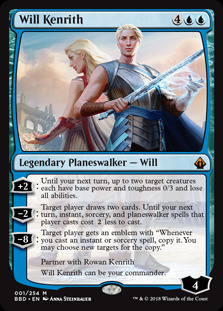 The numbers are very similar to the first round, with commons and uncommons at 10 and rares at 3, but Rowan Kenrith and Will Kenrith are at 2 instead of 1 like the rest of the mythics were. The rest of the rates are unchanged, except that Brightling doubles its rate to join the Kenriths at 2. 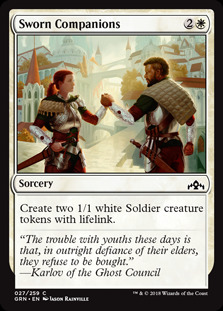 Speaking of Battlebond, it actually makes its way to the main curation list with alternate arts for Tidespout Tyrant , Doubling Season , Veteran Explorer , and more. The most obvious consequence of rotation is the removal of cards from Amonkhet and Kaladesh, and almost 500 cards were removed from the list. Some new Dominaria and Core 2019 cards were added as well, but that only ended up at a net of 189 cards added. One notable thing on the high end was that five full sets (foil and non-foil) were removed while only two were added, so it’s slightly less top-heavy. A total of 358 unique cards had their curation numbers changed, and the net result is a cut of the total curated pool by 1,054 cards. There were new promos like Ash Barrens and Chalice of the Void alongside the new Guilds of Ravnica promos (including Impervious Greatwurm , which will start at a rate of 50), while others like the From the Vault: Transformed cards were removed. In terms of supplemental sets, Commander 2014 got a massive culling in exchange for Commander 2017 cards. 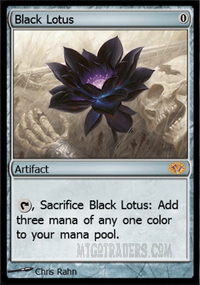 Other than that, the major change is that the Moxen and Black Lotus are back up to 6 from 3, so those will take a dip. Guilds of Ravnica feels like it’s the confluence of all the guaranteed hits: Ravnica has casual appeal, the mechanics lean towards Spikes, Assassin’s Trophy and the shocklands are obvious constructed powerhouses, and more. It’s also coming at the time when confidence is shaky: Arena is about to take the next step despite not having answered important questions, pro play is stuck at the eSports crossroads between viewership and pro satisfaction, card quality is going down while counterfeits are getting more prevalent (and more socially acceptable in some circles), and the competition is the highest quality WotC has seen since the TCG boon. I just hope the high quality of the game can persevere through all the adversity. As for me, the last bit of news in the update that’s relevant to me is the Flashback schedule. Ignoring the cubes and the redacted event, there are two old draft formats: Innistrad and Time Spiral Block. My Time Spiral article could either be a remaster or an in-depth article since I have enough experience with the format, but Innistrad would be my third article on that format, and I feel like I’d be repeating myself too much. Is there anything else people would want to read about Innistrad, or should I just skip it (and/or get my old article moved back to the top)? Of course, I’m still waiting for if/when the next Masters set gets announced so I can get back to work for that. Either way, until my next article. 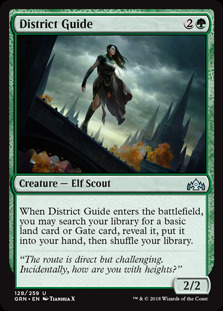 Note that I accidentally said District Guide was common when it's uncommon, so 5-color is slightly weaker (though everyone will pick it regardless).